Charles WEBBER Jr (1764 – 1837) was Alex’s 5th Great Grandfather; one of 64 in this generation of the Shaw line. Charles Webber Jr. was born in 1764 in Dresden, Lincoln, Maine. His parents were Charles WEBBER and Hannah CALL. He may have married Ruth THATCHER 2 Apr 1792 in Yarmouth, Maine. He also may have married 18 Apr 1793 in Yarmouth to Mary STURGIS. Concerning the Cortright and Webber families in America 1925 states he married Judith CHADWICK and had twelve children. Charles died 29 Nov 1837 in Winslow, Kennebec, Maine. Vassalboro; Village Cemetery, North Vassalboro; and Webber Cemetery, Vassalboro, respectively ( MOCA 4:2655 and 2684). Marriages/intentions in VR Vassalboro. Ruth Thatcher’s father may have been James THATCHER, from Yarmouth, Cape Cod as were many of the early Vassalboro settlers. Mary Sturgis was born 12 Dec 1767 in Yarmouth, Barnstable, Mass. Her parents were Edward STURGIS V and Mary BASSETT. Edward Sturgis and family moved from Yarmouth to Vassalboro in 1795 when Mary would have been about 28 years old. If Charles did marry Ruth Thacher in 1792, Mary Sturgis would have been his second wife. 17 Mar 1821 Vassalboro Kennebec Maine. Oliver deposed on Feb 22, 1860 that he was a grandson of Charles B WEBBER. I have researched the families of Charles’ brothers in depth. There are no Olivers. There was a Charles Webber Jr. living in Vassalboro with a large family. See 1800 and 1810 census records below. Even though he had at least nine and probably twelve children, there is no record of their names. The Webbers were a leading family in Vassalboro. Webber Pond is the largest lake in the area. Charles, Jeremiah and Oliver were all Selectmen in different eras. Oliver’s wife Abigail Hawes grew up in Vassalboro and had her first child when she was 21 so it is very likely that Oliver grew up in Vassalboro as well. Oliver Webber was related to Charles’ brother Jeremiah because he became guardian of Jeremiah’s grandchildren when their parents died. According to the 1800 and 1810 census records, Charles was the only Webber in Vassalboro that had a boy who could have been born in 1797. The settlement of town of Vassalboro commenced in 1760. for ten years only eight families had become residents including those in what is now Sidney that was first included in the limits of Vassalboro. Four families settled on the river front below what is now called riverside. Charles WEBBER came in 1765, soon after his brother Joseph Webber came. Charles Webber was first town treasurer of Vassalboro 1771, was selectman in 1773, Joseph Webber was selectman of Vassalboro in 1778. Jeremiah Webber (Charles’ son) was selectman in 1817 and Oliver Webber was selectman in 1840 and 1841. Oliver Webber was appointed guardian of Jeremiah’s son Horatio Nelson Webber’s children when Horatio died in 1838. Illustrated History of Kennebec County 1892 – One other place and kind of worship will not be forgotten so long as the links of tradition can touch each other â€” the church and teachings of Charles Webber, who resided on the river road near Riverside, in the house now occupied by Wallace W. Gilbert. Across the road, on what is known as the James S. Emery place, Mr. Webber erected a small edifice in the last few years of the last century. Here he had preaching of his own, and constituted himself the pastor. What was more conspicuous in this arrangement was the fact that said Webber could not read, and depended upon his wife for that important attribute. He could readily grasp the scripture reading of his wife and give wholesome explanation thereon; and only once was his knowledge clouded, when his wife read “log” for “lodge” in the wilderness. His manner of announcing a text was: ” If Polly tells me aright you will find my text, etc.” He urged sinners to repent, often saying that it was as impossible for one to enter heaven as it was for a shad to climb a tree. His eccentricities and goodness survive him, as does the old church, which, on another site, is the residence of Freeman Sturgis. Churches.—The first religious organization in Sidney was formed in the southwest part of the town, in 1791, by the Calvinistic Baptists, who named their church Second Vassalboro. Asa Wilbur and Lemuel Jackson, then local preachers, were the leaders. The former became the pastor in 1796, and in 1808 he represented the town in the general court of Massachusetts. The church was diminished in 1806, when nineteen members left to form the Second Baptist church, and was increased by a revival in 1811. In 1814 the British fleet hovered on the coast of Maine. Vassalboro raised companies by enlistment. One was raised for Lieutenant Colonel Moore’s regiment, and the commissioned officers were: Daniel Wyman, captain; Alexander Jackson, lieutenant; William Tarbell, ensign. Thomas Hawes, Daniel Whitehouse, Zenas Percival and Roland Frye were sergeants; John Clay, Gersham Clark, Thomas Whitehouse and Jonathan Smart, corporals; George Webber [Charles’ younger brother? ], musician. There were twenty-nine privates. Wing’s company, enlisted in Vassalboro, was attached to the same regiment. The commissioned officers of the company were: Joseph Wing, captain; Levi Maynard, lieutenant, and Nehemiah Gould, ensign. The non-commissioned officers were: Elijah Robinson, Moses Rollins, Stephen Low, Josiah Priest, .sergeants; Levi Chadbourne, Amasa Starkey, John Frye, Reuben Priest, corporals. The musicians were Enoch Marshall and Stephen Townsend. The privates numbered fifty-three men. Still another small company was enlisted for Moore’s regiment, and the captain was Jeremiah Farwell; lieutenant, Aaron Gaslin [Charles’ cousin]. Charles WEBBER, Eli French, John G. Hall and Elijah Morse were sergeants; Benjamin Bassett, Nathaniel Merchant and Heman Sturges, corporals; John Lovejoy, musician; and the file of privates numbered thirty men. Another version of Farwell’s company: A company was drafted from Vassalboro, of which Jeremiah Farwell was commissioned captain; Nathaniel Spratt, lieutenant, and Nehemiah Gould, ensign. Charles WEBBER, Amariah Hardin, jun., Jabez Crowell and Elijah Morse were sergeants; Rowland Frye, Samuel Brand. Benjamin Melvin and Thomas Whitehouse, corporals; Washington Drake and Timothy Waterhouse, musicians. The company embraced sixty-seven men as privates. A third version has Capt. J. Farwell’s Company, Lieut. Col. E. Sherwin’s Regiment. From Sept. 24 to Nov. 10. 1814. Raised at Vassalboro. Service at Wiscasset. There are several court cases involving a Charles Webber in the Kennebec County Court in the early days of Vassalboro. Charles Webber Jr. lived next to his father Charles Webber in the 1800 census. They both lived next to Edward Sturgis (arrived Vassalboro 1792) and James Sturgis (arrived Vassalboro 1796). Interesting considered some sources state Charles Jr. Mary Sturgis and other sources state his brother William married her. Sturgis has been spelled Sturges as well. Charles Webber Sr – 1800 Census Charles Sr. was born before 1755. The youngest child we know about, Jeremiah, would have been about 14 in 1800. Charles Webber Jr. 1810 Census This one shows Charles age between 26 and 44 meaning birth between and 1765 and 1784. We believe Charles was born in 1764. Note that this Charles’ wife was older than 45 in this census and he was probably was close to her age. This census is in alphabetical order with Charles next to Benjamin Webber and several other Webbers. If Charles died before the 1820 census, Vassalboro Webber widows include: Sally – 1 child at home, Sarah – no children at home, and Sarah – 5 children at home. The first two have too few children at home to be Charles’ likely widow. This last Sarah appears on the same census page as our ancestors Isaac HAWES, Seth RICHARDSON, and Joseph COLEMAN. Isaiah Hawes Jr. , born in 1827, is the only son in a family of twelve children of Isaiah and Desire (Collins) Hawes. He was the second cousin of Oliver WEBBER’s wife Desire HAWES. Isaiah’s father was Isaiah Hawes Sr. (1777- 1852), grandfather was Ebenezer Hawes III (1735 – 1809) and great grandfather was our ancestor Ebenezer HAWES JR, (1705 – 1741) all of Yarmouth, Mass. Isaiah Sr. came to Vassalboro in 1809. His brother Prince Hawes, father of Rev.’ Josiah T. Hawes, of Litchfield, came from Yarmouth, Cape Cod, in 1802. The Isaiah Hawes Jr. married Lucy T. Hatch and has five children: Edwin A., Delia C, William I. (moved to California), Harry P. and Alice M.
Their residence was built by Dea. James Thacher, on the farm where the original Charles [B.] WEBBER [1741 – 1819] first settled. Google Driving Directions for Kennebec County towns mentioned below. In 1814 the British fleet hovered on the coast of Maine; Eastport, Bangor and other places were seized during tlie summer. The county of Kennebec was on the alert, and many companies of men were enlisted. Captain Dearborn’s company was also raised in Hallowell and was attached to Lieutenant Colonel Stone’s regiment, with Benjamin Dearborn, captain; Thomas B. Coolidge, lieutenant, and William Clark, ensign. Isaac Smith, Enoch Marshall, Ebenezer White and Sheppard H. Norris were sergeants; Ephraim Mayo, Thomas Fillebrown, jun., John Folsom and Benjamin Plummer, corporals; Seth Sturtevant, James Batchelder, Elias Webber and Bradley Folsom, musicians. The company had thirty-seven privates. Wow! That is a puzzle. Anything is possible with this family. George and Daisy divorced in 1902 and put their kids in an orphanage until George remarried. Throughout his life, George lied about his age, both their sons changed their names and one, my grandfather, “changed” the year he was born 3 times!!! They were the original dysfunctional family. Daisy did remarry, but supposedly to a man named Cassidy. Not much else is known about her. George was born about 1801 in Maine. He married Rebecca H. [__?__]. In the 1850 census, George was a Methodist Clergyman in Readfield, Kennebec, Maine. In 1850, three Nickerson children lived with the Webbers: Susan R (age 22) Ruth H (age 20) and Nehemiah Nickerson (age 17) In the 1860 census, the Webbers had moved to Portland, Cumberland, Maine, but by the 1870 census, George was back in Readfield. Julia D. Webber (1807 – ) was now keeping house and Dorcas Webber (1806 – ) was housekeeper. In 1827 Gardiner was made a separate station, and had 159 church members, with Phineas Crandall pastor. His successors have been: John Atwell, Stephen Waterhouse, Justin Spaulding, R. E. Schermerhorn, Aaron Sanderson, John B. Husted, John W. Atkins, Moses Hill, Eaton Shaw, Joseph Colby, George Webber, J. C. Aspinwall, Parker Jaques, Daniel B. Randall, Charles Munger, Howell B. Abbott, Charles C. Mason, Charles W. Morse, Pascal E. Brown, W. S. Jones, John F. Hutchins, George D. Lindsay, Israel Luce, Edward C. Bass, George W. Hunt, Ammi S. Ladd and F. C. Haddock, the present pastor. The church has a membership of 260 and is in a prosperous condition. Benjamin S. Smith is president of the board of trustees. i. George C Webber b. Jan 1838 Hallowell, Maine; m. Sarah P. [__?__]. In the 1880 census, George was a physician in Millbury, Worcester, Massachusetts. By the 1900 census, Sarah was widowed in Millbury and in 1910 she was living in Cambridge. iv. Walter G Webber b. Aug 1849; d. before 1910 census m. 1870 to Elizabeth C. [__?__] In the 1900 census, Walter was a druggist in Bath, Sagadahoc, Maine. William Webber was farming and living next to Charles’ brother George Webber’s widow Temperance in Vassalboro the 1850 census. This William was born in 1802 in Massachusetts and married Mahalia Thirsa Laiten (1811 – ) This William had died by the 1860 census. 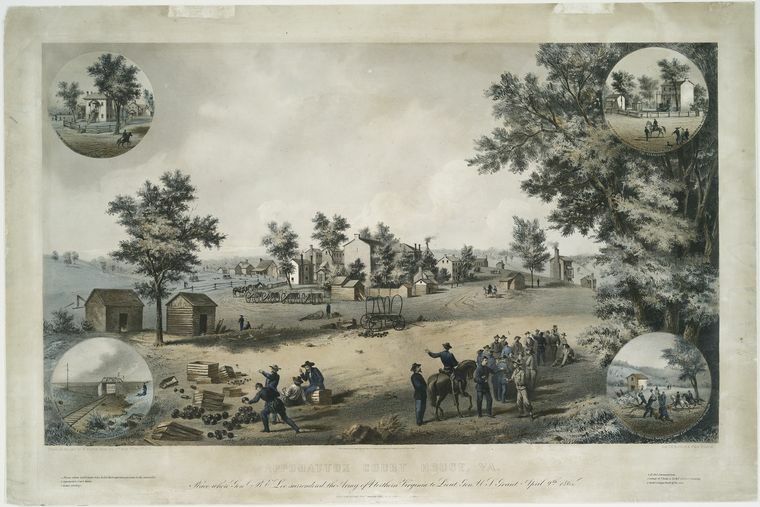 Massachusetts 6th Infantry Regiment on 22 Apr 1861. Amory Enlisted in Company L Massachusetts 3rd Cavalry Regiment on 15 Nov 1861. Mustered out on 02 Jan 1865.
wounded, and 157 of the horses. Transferred to Company D, U.S. Veteran Reserve Corps 9th Infantry Regiment on 02 Jan 1865. Mustered out on 07 Oct 1865. Promoted to Full Sergeant. Susan B. Fletcher was born 28 Nov 1818 in Littleton, N. H. Her parents were James Fletcher (11 Nov 1778 Chesterfield, N. H., and Lois Spear. She married Amos Webber of Chelsea, Mass. who died 16 Apr 1855 ; s.p. i. Amos Webber Jr. b. 1837 Maine Enlisted as a Private on 21 August 1861 at the age of 24 in Company K, 7th Infantry Regiment Maine on 21 Aug 1861. Died Company K, 7th Infantry Regiment Maine on 14 Jan 1862 at Georgetown, DC. Seventh Infantry.–Col., Edwin C. Mason; Lieut.-Cols., Thomas H. Marshall, Selden Connor, Thomas W. Hyde; Majs., Thomas W. Hyde, James P. Jones (known in the army as the “fighting Quaker”), Stephen G. Fletcher. This regiment was raised irrespective of divisional limits, and was organized at Augusta, Aug. 21, 1861, to serve three years. It left the state Aug 23, 1861 and arrived in Baltimore on the 25th. It remained here until Oct. 25, when it was moved to Washington. Nov. 7th, it crossed the Potomac into Virginia and went into camp near Lewinsville, Fairfax county, where it remained until March 10, 1862, engaged in picket duty, scouting and drilling. Sickness and death had been prevalent in its ranks, and Co. F became so reduced in numbers it was disbanded, a new company raised by Capt. Fletcher of Skowhegan, being mustered into service Jan. 23, 1862, in its place. Asa was born about 1810. m. Matilda [__?__] In the 1850 census, Matilda was living in Sidney, Kennebec, Maine. iv. Paulena Webber b. 1840 Sidney, Kennebec, Maine; m. 13 Nov 1858 in Nashua, NH to William Bennett; d 5 Jul 1901 Pauline shot herself twice in the heart on the steamer Kennebec running between Boston and Gardiner. Loring Webber was born 23 May 1813 – Vassalboro, Kennebec, Maine. His father was the Rev. Charles Webber, who died in Winslow about 1840. He married Olive Eastman. Loring died 9 Apr 1885 in Clinton, Kennebec, Maine. Loring Webber came to Clinton in early life, where he reared a family of eight children: George E., Charles F., Allston, John, Caroline, Lewann, Elvira and Emma. In the 1850 census, Loring was farming in Clinton, Kennebec Maine. There was a Loring Webber living in Litchfield, Lincoln,. Maine in the 1810 census and in Bowdoinham, Lincoln, Maine in the 1820 census. i. Caroline Webber b. 25 Aug 1833 in Clinton, Kennebec, Maine m. Oliver Dickey on 1 July 1852. Oliver as born in Clinton on April 17, 1829. His parents were Oliver Crowell Dickey and Margaret or Mary Ellen Pushaw. They had four sons, William, Franklyn, Charles and George. Oliver W. Dickey enlisted at Augusta on October 13, 1862 and was mustered in for a period of nine months. He was a private in Co. C, 24th Infantry Maine Volunteers. His commanding officer was Samuel S. Brown of Clinton. He contracted typhoid fever while he was stationed at Bonnet Carre, Louisiana sometime after February 26, 1863. He died at the General Hospital, U.S. Barracks, New Orleans, Louisiana on March 17, 1863 and was buried on the hospital grounds. Two and a half years later, on 29 Aug 1865, Caroline died and their four sons were orphaned and became the wards of Caroline’s parents Loring and Olive. $8.00 per month was paid as a pension until the youngest turned 18 on March 16, 1877.
iv. George E. Webber was born in Clinton in 1844. He went to California in 1862, where he remained until 1884, when he returned to Clinton. He took care of his parents until their death in 1885, and has since  been a farmer. Of the several post villages within the limits of the town, North Vassalboro is the most important. The large woolen mills located here are the principal factors to the business of the village. Levi Webber was for thirty-nine years master mechanic for the mills. Joseph was born in 1785 in New Hampshire. In the 1850 census, Joseph was farming in Vienna, Kennebec, Maine. Hiram Webber was born in 1804 in Maine. His parents may have been John Webber and Mercy Harlow. He married 9 Jul 1825 at Age: 21 in Vienna, Kennebec, Maine to Abigail Healy. One source states that his parents were Samuel Webber and Jane [__?__]. Hiram died after the 1880 census where he and Abigail were retired farmers in Mount Vernon, Kennebec, Maine. In the 1850 census, Hiram was a farmer in Augusta, Kennebec, Maine. ii. Calvin E Webber (1831 – after 1850) A Calvin Webber went to California in 1852 and was a fruit dealer in Chicago married to Frances [__?__] in the 1870 census. 4. George Webber a son of George and grandson of Richard Webber, was born in Richmond, Me., in 1811. His father served seven years in the revolutionary war. His wife, Rebecca (married in 1836), is a daughter of Benjamin and Margaret (Curtis) Merriman.and granddaughter of Walter Merriman.of Harpswell, Me. Their children are: Reuel S., Adaline C., Rebecca A., Mary E., Sophronia H., Arista, Thirza E., George F., Pauline S., Nellie E. and Charles H., who married Lillian M. Maxwell, and now lives with his parents on the homestead farm. Elbridge was born in 1811 in Maine. His parents may have been John Webber and Mercy Harlow. He married Jerusha Janes. There are at least two other Elbridge Webbers born in Maine around the same time, so h e is probably from a different Webber branch. In the 1850 census, he was farming in Gardiner, Kennebec, Maine. Children of Elbridge and Jerusha. ii. Elbridge Wesley Webber b. 5 May 1839 Gardiner, Kennebec, Maine; d. Nov 1914 Wollaston, Mass and is buried in Gardiner. 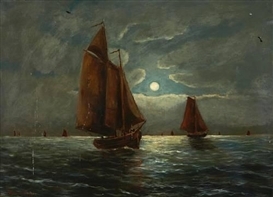 Landscape and marine painter Wesley Webber lived in Boston from 1870 to 1890 and in New York City from 1892 and was self-taught. He is considered one of the finer landscape painters who painted from life in the Conway area of New Hampshire and along the New England coast and he is reminiscent of the Hudson River School in style and manner. Webber served in the Civil War (Company B of the Sixteenth Maine Volunteer Infantry Regiment) and was present at General Lee’s surrender at Appomattox. His original sketches made at the surrender, along with his finished illustrations of the Civil War were shown at the Boston Art Club and brought Webber considerable fame, recognition and fortune. Many of his Civil War scenes were published as wood engravings in Harper’s Weekly and as a lithograph published by J.H. Bufford of Boston. He was discharged from Civil War service in Augusta, Maine, June 15, 1865 and he opened a studio in Gardiner, where he became a carriage painter. 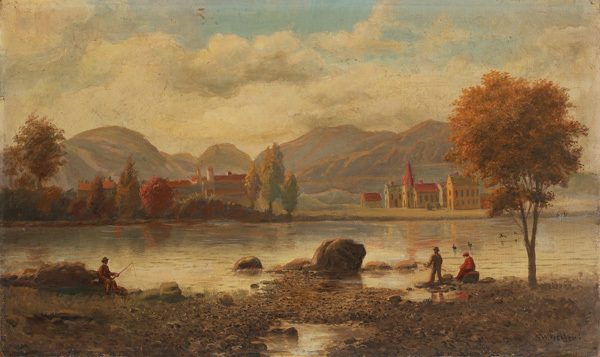 Thereafter, Webber earned a fine reputation as a marine and landscape painter, but at the end of his life (ca. 1900-1914) he became an alcoholic and his style weakened along with his reputation. 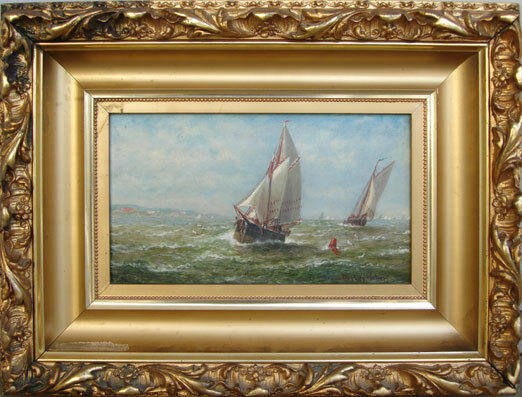 Webber shared a Boston studio in Pemberton Square and then shared a Boston studio with marine painter William P. Stubbs (1876-) and kept other studios in New York City until his death. Every summer he went to Conway, New Hampshire to paint the hillside, where painters John J. Enneking, Frank Shapleigh and others joined him to paint. 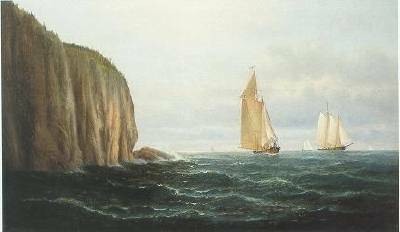 He also painted in Manchester-by-the-Sea, in Nova Scotia and in Canada. One of his most famous paintings isKennebec River, Maine Boat Shop and Unidentified Vessels Ice-bound at Gloucester (both at the Peabody Museum, Salem, MA). He is also represented in the permanent collections of the Boston Athenaeum; New York Public Library; the Brooklyn Museum; Portland Museum of Art (Maine) and elsewhere. From 1897 to 1914 Webber’s New York City studio at 11 East 14 th Street was filled with artists. In 1914, he left the city for his daughter’s home in Wollaston, MA, where he died. In February 1915, his family sold the contents of his studio at the Boston auction house of C.F. Libbie and Company. vi. Frederic G Webber b. 1850 Maine In the 1880 census, Frederic was a widower, working as a teamster and living back with Elbridge and Jerusha in Gardiner. This entry was posted in -7th Generation, Line - Shaw, Veteran and tagged Vassalboro. Bookmark the permalink. I am descended from Loring Webber of Clinton, Maine. In the History of Kennebec County, it states that in Clinton, George Webber, (brother of my gr-gr grandmother Caroline), was the son of Loring Webber and the grandson of Rev. Charles Webber who died in Winslow about 1840. Loring was born in Vassalboro. On the Miner Descent website, specifically on the page of Charles Webber Jr.,(son of Charles B. Webber. and Hannah Call), Loring is listed under “Other Webbers in Kennebec, Maine in 1850 census (For process of elimination of Charles Webber’s children)”. When the History of Kennebec County was written, George Webber was still living and would have known who his own grandfather was, so shouldn’t I believe that Loring is in fact a son of Charles Webber Jr.? I also found a marriage record in the Yarmouth, Massachusetts Vital Records Volume 1 which gives the marriage record of “Charles Webber of Vasselborough in the county of Linclon, (sic) to Molly Sturges Yarmouth April 18, 1793″. Molly and Polly were common nicknames for Mary. I believe that Charles Webber Jr. and Mary or Molly Sturges Webber were the parents of Loring Webber who moved to Clinton, (Clinton and Vassalboro are only about 10 miles apart). Loring also had a son and a grandson named Charles Is there a way to verify this tie? I’ve spent more time on Charles Webber Jr than any other ancestor. His brothers, sisters, nephews and nieces are all well documented. Why is there no record of his twelve children? A powerful revival in 1805, under the preaching of Rev. Asa Wilbur, resulted in the formation of a second Baptist church, February 7, 1806. The organization was perfected at the house of Benjamin Dyer, on the river road, and signed by seventeen members: Nathaniel Reynolds, jun., Edmund Hayward, Asa Williams, Benjamin Dyer, John Sawtelle, Charles Webber, jun., Henry Babcock, Mary Matthews, Mary Reynolds, Jemima Dyer, Mercy Matthews, Thankful Faught, Elizabeth Andrews, Eunice Williams, Abigail Tuttle, Sarah Ingraham and Susanna Hayward. The Webbers and most of the early residents of Vassalboro were from Yarmouth. Interesting that Charles went back down south to be married. Thank-you for replying. It is certainly confusing trying to figure these Webbers out. My gr-gr-gr grandfather Loring was first taxed in Clinton in the 1830s so I believe he stayed here after leaving Vassalboro. There are also chattel records here in Clinton from the 1840s or 1850s that involve Loring Webber. Considering the close proximity of Vassalboro, Winslow and Clinton, it would make sense that he stayed in this area. I do wish I could find out for sure so I could claim Charles and Hannah(Call) Webber. I’d like to see the deposition that Oliver A Weber did 22 Feb 1860 indicating that Charles B Webber was his grandfather. Why did he do the deposition? Was it about a land dispute or inheritance dispute? Was his father’s lineage in question? Does anyone have that deposition or know where to find it? Cathy, Oliver Webber ia mystery to me. He appears in the census records and I have found birth records for all his brothers and sisters, and many first cousins in Vasalboro, but not his birth record. Let me know if you find anything, I made a thorough search and have come up empty about proof of his parents.